This fall, an American flag flew atop a huge, towering crane over ten stories high, poised like a metal skeletal bird over the southern end of Main Street in Ketchum. A very odd sight in this small Idaho mountain town, which plays year-round host to Bald Mountain, home of the world-famous Sun Valley ski resort. Below, dozens of workers lay out the infrastructure of what will be the brand new Limelight Hotel, scheduled to open for the 2016-2017 ski season. 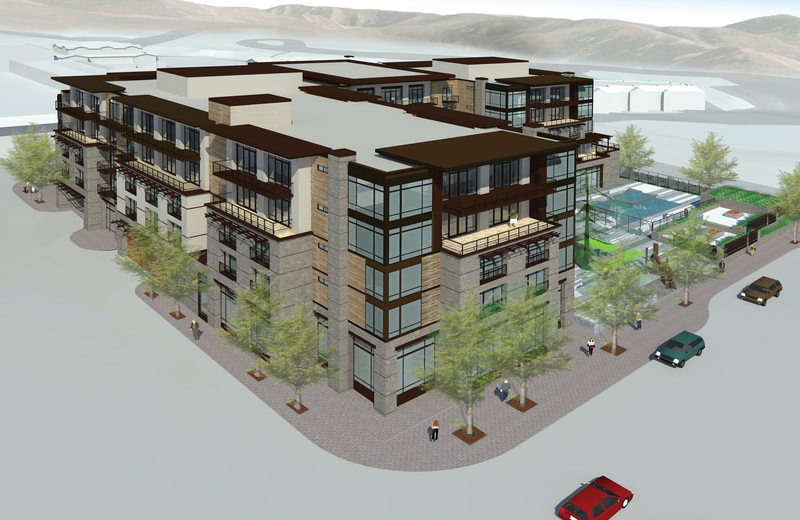 The hotel parcel occupies an entire city block between First and River streets and is in the heart of Ketchum. It’s also the site of the historic Bald Mountain Hot Springs (1929). The owners, Aspen Skiing Co., will model the new hotel and residences after its Limelight Hotel in Aspen, Colorado. 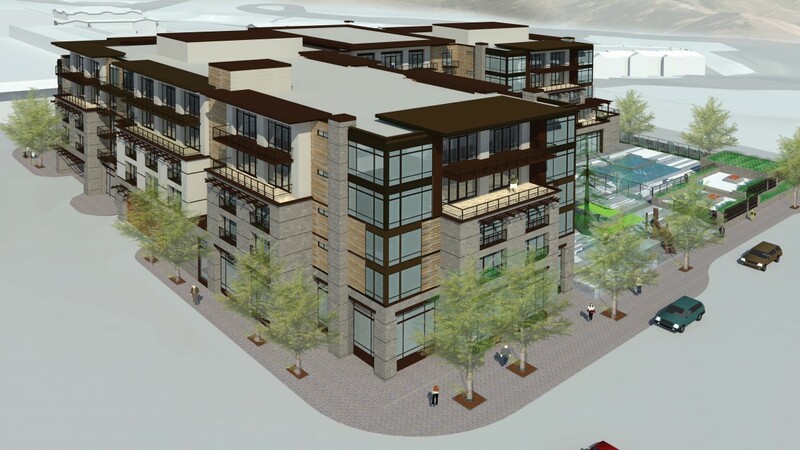 Plans include 108 spacious and modern hotel rooms and suites, inviting and colorful open-plan public spaces with dining, and 14 free market three- and four-bedroom mountain contemporary residential units. The hotel is just minutes from Sun Valley’s River Run base area. The Aspen-based architecture, urban design, and interior design firm, Rowland +Broughton, has recently completed a full interior design program for the Ketchum hotel and residences, with a focus on both environmental initiatives and inspired design. 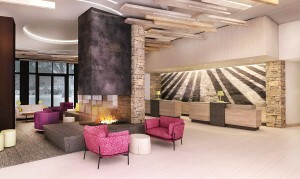 The firm also recently finished an interior renovation of the Limelight Hotel in Aspen. Renderings of the Rowland+Broughton-designed lobby and bar/restaurant at the soon-to-be Ketchum Limelight Hotel. A layering of lighter and darker materials, as well as bringing in vibrant colors to add a casual and playful feeling to the space, will be utilized. Interior materials include wood, wools, metals, and even a hemp fabric, rounding out a multitude of textures. Both old historic photos of the Ketchum and Sun Valley area, as well as contemporary art, will be displayed. After taking in the entrance, guests and the community are encouraged to spend time in the public spaces. The pivot point of these “living rooms” will be a lively bar adjacent to a pizza oven. The second living room, which Broughton and team are calling a “den,” will have a removable stage for live music and performances, encouraging guests to hang out. Large fireplaces will also be focal points. The contemporary interior design is welcoming and invites shared experiences. “The design of the Limelight will allow guests to come back from their day of skiing, fly fishing, or hiking, and then join a community that is enjoying this same type of experience and share their day, and meet new people,” says Jeff Hanle, Director of Public Relations with Aspen Ski Co. “We do this by creating a big communal living room with couches and chairs and nooks and crannies, and spaces to eat and drink and enjoy each other’s company. The hotel hopes to serve people passionate about experiential travel,” explains Hanle. An ideal après ski environment, the hotel will also be a great place to gather and tell stories after a long summer’s hike or bike ride. 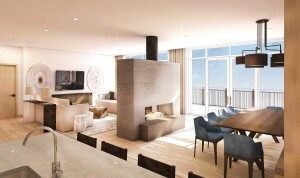 Broughton stresses that the Limelight in Aspen, for which her firm also designed the interiors, has become Aspen’s community living room, and her expectations for Limelight Ketchum is to create that same community vibe. Another great custom feature is a mirrored sliding barn door that leads into a light and airy generously-sized modern bathroom featuring Grohe fixtures, with either a freestanding bath or shower, depending on the room. Large pump-action bottles of lotions and shampoo are supplied, so guests use only what they need, part of Limelight’s Green program. Open and intuitive, the design of Limelight Residences prioritzes gathering. With walls of windows, the interiors never neglect the beautiful world outside. Each main area of the residences will have a gracious living space with a modern two- or three-sided fireplace as its centerpiece, separating the living and dining space so as not to impair visual sightlines, maintaining an open concept and flow. The kitchens will be custom, beautifully designed with a white oak palette, contrasted with a dark zinc metal stove hood and modern appliance package. “The majority of the residences also have built-in banquettes for dining, reinforcing the communal gathering spot. Another great place to come together over food and drinks,” says Broughton. The residence bathrooms have been designed to evoke a spa-like setting with double sinks and beautiful light-colored tile, complete with a free standing sculptured bathtub, a European frameless glass shower, and a separate water closet. Great storage with lock-off rooms are another great feature, if owners opt to put their unit into the Limelight rental program. The outdoor spaces will have spacious decks with tastefully scaled furniture, as well as floor-to- ceiling window walls that slide open to allow indoor/outdoor living. LIMELIGHT RESIDENCES WILL BE MODERN AND SPACIOUS. THEY ARE ALL ABOUT GATHERING AND EASE OF LIVING. Ketchum Limelight is also going for a LEED certification. The LEED green building rating system is designed to promote design and construction practices that increase profitability, while reducing the negative environmental impacts of buildings, and improving occupant health and well-being.